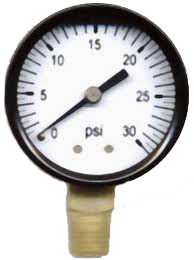 High Pressure Gas Gauge for use on propane forges. This is also the replacement Pressure Gauge for our Smithy's Forge. Attaches to a Regulator. First remove the plug on the Regulator with a 1/4" Allen Wrench. Wrap the the threads with Teflon Tape and connect.